The nearest railway station is Whitstable, about 0.5 miles away. 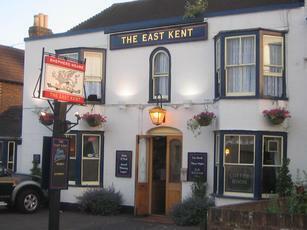 It's the first pub you come to when coming from the station into the town area. Beer is well kept. It has a large decked rear courtyard area which is protected on all sides by high walls. Good Thai food, served inside or out. IF I FALL AGAIN WILL YOU FORGIVE ME? IF I STAGGER WITHOUT FALLING...WILL YOU FORGIVE ME THEN? IF I DAB AT THE BROWN SAUCE ON MY SLEEVE WITH A SPITAL MOISTENED NAPKIN...FORGIVEN? IF I FALL, THEN GET UP, BUT FALL AGAIN MORE CONCLUSIVELY...FORGIVEN OR SENT TO PURGATORY*? IF I SLIP ON A WET FLOOR (POSSIBLY IN THE LOBBY OF A HOTEL OR THE FOYER OF A POSH OFFICE BLOCK...IN BISHOPGATE, PERHAPS) CAN I CLAIM IT BACK ON THE INSURANCE? * Purgatory or Ramsgate....same thing really. I HAVE FALLEN AGAIN, AWKWARDLY THIS TIME. Lieutenant Pigeon was a British musical group popular in the early 1970s. It was fronted by Rob Woodward. The group's sound was dominated by a heavy ragtime-style piano played by Woodward's mother, Hilda. Hilda was briefly a member of Uriah Heep but was fired after one album and a tour of Japan after a fight in a hotel bar with Mick Box, during which she hit the Heep guitarist over the head with a glass ashtray. Lieutenant Pigeon achieved two UK hits: "Mouldy Old Dough", written by Rob Woodward with bandmate Nigel Fletcher, reached number one in 1972, followed by "Desperate Dan" (number 17 in 1973). Both tracks were largely instrumental, with the titles providing virtually the only lyrics. "Mouldy Old Dough" (the title being an adaptation of the 1920s jazz phrase, "vo-de-o-do") became the second biggest selling UK single of the year, behind The Band of the Royal Scots Dragoon Guards' bagpipe version of "Amazing Grace". Lieutenant Pigeon scored a further hit, in the autumn of 1974, when it reached number 3 in the Australian charts with a cover version of "I'll Take You Home Again, Kathleen". Hilda Woodward died aged 85 on February 22 1999. Mick Box sent flowers.